In June 2011, the Department of Veterans Affairs (VA) issued a solicitation for offers on 96,000 square feet of medical office space in Colorado Springs, Colo. US Federal Properties (USFP) submitted its best and final offer and was awarded the project in May 2012. Colorado Springs is home to several important military installations, including the United States Air Force Academy, the North American Aerospace Defense Command (NORAD), Fort Carlson, as well as Peterson and Schriever Air Force Bases, making the addition of a VA Clinic an important asset to the community. On the outskirts of the city, the clinic was built on a centrally located site that is easily accessible from any of the nearby military establishments. 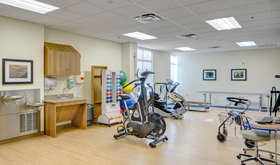 The clinic’s orientation optimizes beautiful views of the Colorado Springs foothills. Its location in the foreground of nearby Pikes Peak and Garden of the Gods adds to the warm and welcoming appeal. The result is a quality healing environment that incorporates relaxation nd nature. 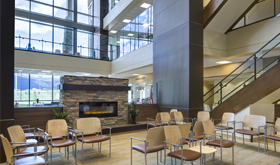 While the exterior design is embedded in the context and natural environment of Colorado, the interior waiting area — a ski lodge-inspired, three-story atrium with a stone fireplace — is intimate and comfortable for patients and guests. Completed in fall 2014, the clinic is one of the top outpatient veterans care facilities in the region. Designed to achieve LEED Silver Certification, low-flow water fixtures, reduced interior light density and planting of native grasses and protective tree stands are a few features contributing to the building’s energy grade. For this project, USFP and its partners received the 2014 Excellence in Design Award and an Honor Award from the Design-Build Institute of America’s Mid-America Region (DBIA-MAR).